Sugar Tinted Lip Treatment: I swear by this stuff. I am almost out of mine, so naturally I have to restock. Bauble Bar Necklace: I'm a sucker for all statement necklaces, but this one I must make mine. I love the touches of blue mixed in. GlamGlow Tingling & Exfoliating Mud Mask: I was sold at 10 minute anti-aging "facial in jar"...yes please. Zella 'Live-In' Leggings: These are a repeat offender here on this blog, but they are that good so it's acceptable. Right? Another item I swear by and love! Boostcase iPhone 5 Mint Case and Battery: This one actually falls more into the category of needing. Would be perfect for traveling or just when I need the extra battery life (I feel like my phone always dies around 3pm!) Also love this white option from Target, per usual. Diptyque Scented Candle: Who can talk this candle's praises? I've seen it everywhere as one that is so popular, and I really want to try it! Mon Amour 'My Love' Sweater: Can't get enough of the casual sweatshirts this year. Love the saying on this one, that is has stripes (of course), and is only $38. I would recommend sizing down on this...I got an XS and it fits great! 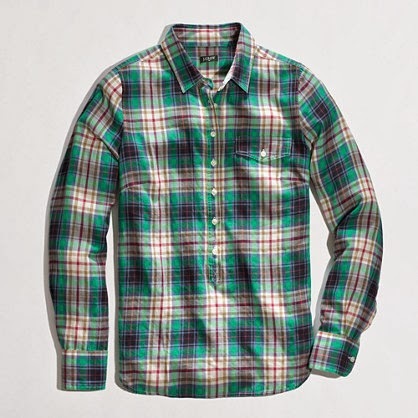 This top is so soft and you can never go wrong with plaid. 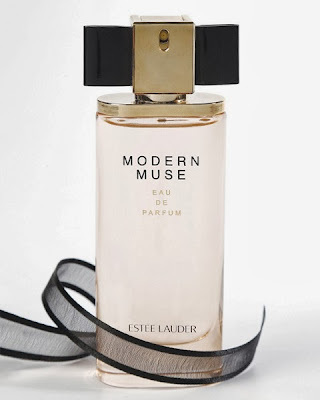 Estee Lauder's new perfume, Modern Muse! I can say without a doubt it's my new favorite scent for this year. It combines a blend of woods and rich florals. It actually won Allure's Best New Fragrance Award for 2013! I want to hear about this GlamGlow... you're like the fourth person I've seen mention it lately.... SO you try it out and let me know ;) deal!? I love the Fresh lip balm! Also I really want to try the GlamGlow mask!! I want that candle!!!! Or any candle for that matter! I'm obsessed (even though half the time I can't smell them). I swear by that lip balm, and holy cow.... did not know about the iPhone battery/case thingy. That'd be so convenient! Also, I need to invest in Glam Glow. I'm gonna be 30 this year (eeek!) so I feel like I should probably start doing an anti-aging regimen. And subscribe to AARP. 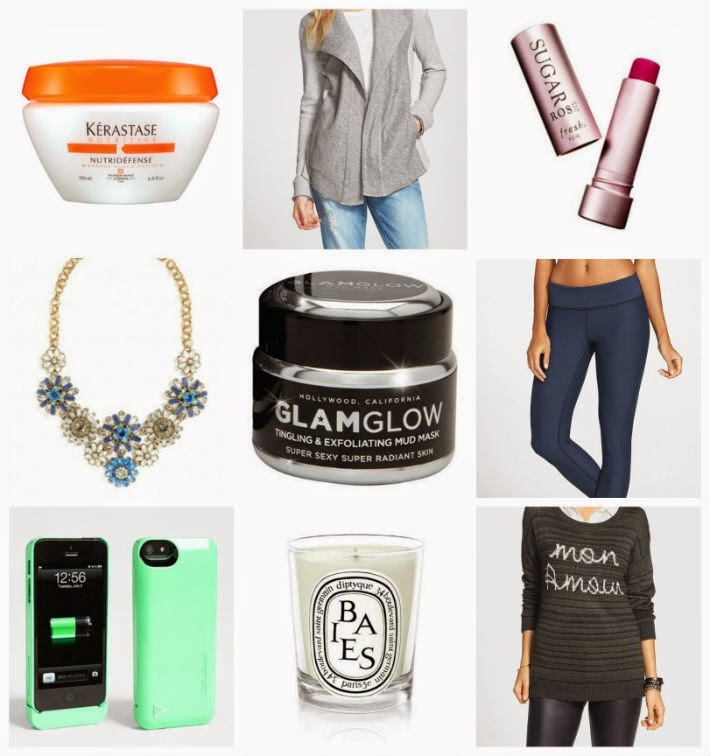 I have that glam glow mask and it is amazing! Sugar lip tints are my absolute fav! I love the glam glow products, I havent used this mask but the others that I have used are wonderful!! PS Im with you about the phone charger case, I just might be adding that to my Target cart in the near future! I purchased the small size of this glam glow mask last year. (They have it in the checkout bins at Sephora.) It definitely tingles! I really liked it. So, when I had my 20% VIB coupon, I went back for the large version. However, they were sold out of black so I got the white bottle. It doesn't have the tingling effect but I saw the same results. It can be used as a spot treatment as well. Needless to say, my bottle is nearly empty and I'm ready for another! I really, really want the sweater and leggings, which kind of shows how lazy I've gotten this winter - all I care about is being warm and cozy! But the GlamGlow looks really interesting - I think I'll follow Kait's advice and see if I can get a sample of it! Interested to hear how you like the mud mask! Love me a good J Crew pop over! Super cute plaid choice girly :) I am also guilty of filling carts and letting stuff sit haha. I love window shopping too!! I also swear by the Sugar lip treatment and just got it in the berry color! Love it! Sugar is my new obsession - I got it in a gift bag at an event i attended last week and am obsessed now!! The bauble bar necklace is perfect - you should most certainly get it! im the SAME WAY with things in my cart!! I am especially depressed when I see "no longer available." and im all, damn i waited too long!! i think i need to try the facial in a jar! that looks an sounds amazing! I LOVE Glam Glow! I've tried the black and the white one-- both amazing!!! Def recommend!